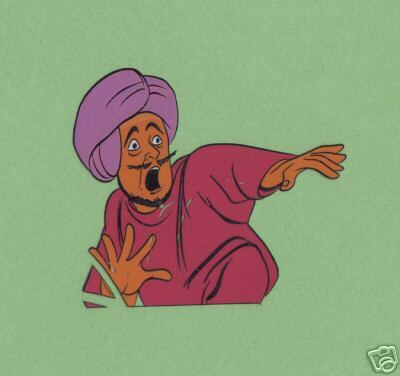 From the scene at the start of the episode where Jonny is attempting to make the rope rise into the air by playing on Hadji's Indian flute. 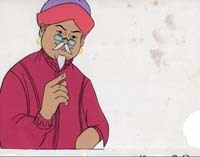 (see episode screen grab at right) However, this appears be a composite cel, as Bandit's position never appears during the episode as shown in the cel when Jonny's position is as shown. For that matter, there is no exact match for Bandit in this part of the episode (although a few frames are fairly close); it may be that the Bandit figure is from another scene or even different episode. From the scene where the tiger photographic hunt has taken an unexpected turn, and Dr. Quest's driver has abandoned the good doctor in the back of the vehicle alone (see episode screen grab at right). From the scene where Race is about to pull down the map of India (see episode screen grab at right); you can even see the map ring in his right hand. 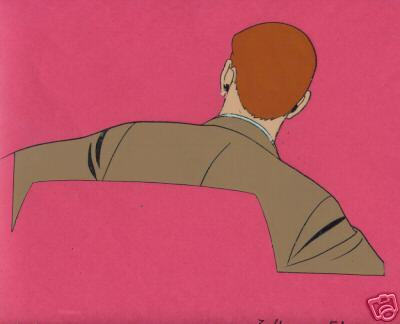 Here is another cel from the same scene, just a few frames prior to the cel shown above. 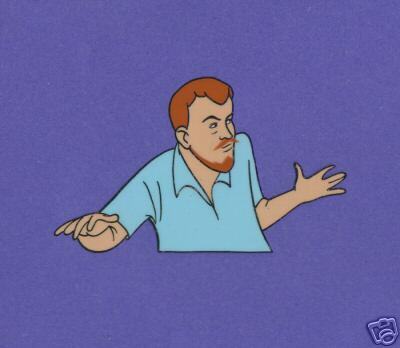 Notice what the choice of background does to the feel of the cel; the gun in the image is NOT part of the original cel. 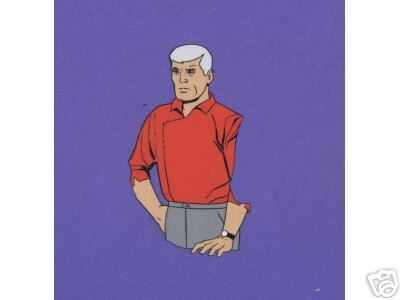 Here's a link to another cel from the same scene; note slightly different position of arm. 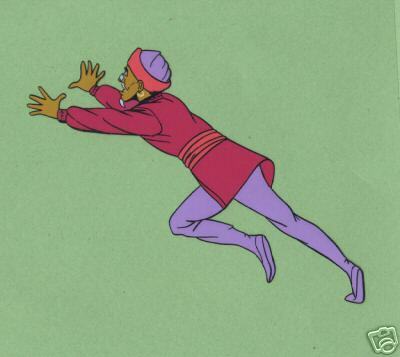 And yet another cel from this scene; this one shows Race just before he reaches up to pull down the map. A background painting showing the map used in the scenes mentioned above; note the changes that have occurred in world maps since this episode. From the scene where the railway car is freed from the engine to go freewheeling back down the mountainside (see episode screen grab at right). From the scene right after Bandit extinguishes the explosives fuse, as Race struggles to free himself from his bonds (see episode screen grab at right).